Five years after Montclair and NJDOT adopted New Jersey’s leading Complete Streets policies, this week Mercer County became the first to have all roads covered – state, county and every municipality. Congratulations to Mercer County for reaching this very important milestone toward making our communities more bicycle and pedestrian friendly! Complete Streets policies require road improvements to support biking, walking and transit for users of all ages and abilities as the rule rather than the exception, and provide for incremental improvements without mandating retrofits. Complete Streets benefit everyone, e.g. better safety (not just for cyclists and pedestrians, but mainly for motorists), higher property values (see walkscore.com) and improved security (more eyes on the street). Those who walk or bike feel better, are healthier and live longer – students who bike or walk to school score better on standardized tests. Realizing these benefits will take time, as responsibility for our roads is divided between the state (for federal and state roads), counties and municipalities. Even a short trip can include roads and/or bridges under the care of many jurisdictions – for example, biking around Princeton’s Carnegie Lake involves traversing 3 counties and 5 municipalities, plus a state and maybe even a federal road. What does a Complete Street look like? It depends – Complete Streets are not cookie-cutter. All of these pictures might be considered examples in some sense, while each may have additional possibilities to make them even more complete. See if you can pick out which picture shows which Mercer County municipality – Trenton, Hamilton, Ewing, Hopewell Township, Pennington, Hopewell Boro, Princeton, Lawrence, West Windsor, East Windsor, Hightstown and Robbinsville. To learn to love our traffic engineers, we must understand why they prioritize cost least when designing roadway improvements. 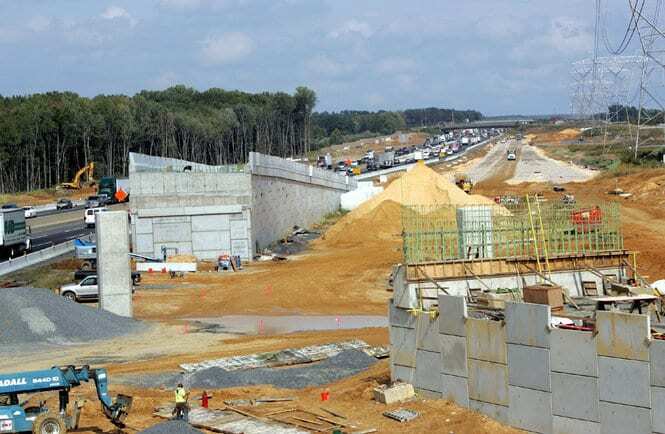 Cost varies a lot – $1M / lane mile is a general rule of thumb, but the NJ Turnpike’s current expansion costs $14.7M / lane mile and Boston’s Big Dig cost $136.2M / lane mile. Standard engineering practice is to build for more speed, which means more and wider lanes, plus expanded roadside sight distances, which may require purchasing right-of-way, etc., all adding to the cost. Also, engineers are required to forecast volume 20 years into the future and build for anticipated increases. But other factors are at work – e.g. a 1961 bridge in Washington State cost $159M in today’s dollars, but the replacement is projected to cost $4.6B, including 2 additional lanes. This dramatic $4B increase over inflation points to issues on the process, financial and political sides, including the revolving door between government and private industry, politicians’ dependence on corporate contributions to get re-elected, government dependence on borrowing to finance road projects, even “commonplace” corruption, according to a New York State report. If nobody has an incentive and/or is held accountable for cost containment, neither politicians nor engineers, it’s easy to see why it’s not a priority. We’ve finished examining how citizens prioritize safety, cost, volume and speed differently than traffic engineers, so our next installment will look at one reason engineers use to convince us that they know best – because of the standards. It’s hard to learn to love our traffic engineers – they don’t see the same world we do, and don’t want to talk about it. Why not? Have you been to a public meeting? The public has issues – many residents have not learned to disengage knee-jerk thinking, do their homework or propose constructive suggestions. 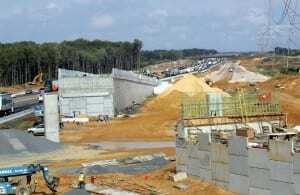 Some are hostile to any government action, including road projects. We choose to live in West Windsor because of the promise of safety, good schools, open space and convenient train commuting. We love our cars, but don’t want traffic in our neighborhoods. Charles Marohn, an engineer and planner, identifies the different values of residents and engineers. In order, residents prioritize safety, low cost, traffic volume and speed, while engineers prioritize speed, volume, safety and cost. Value divergence shows in the effort to improve walking and biking along Cranbury Road. 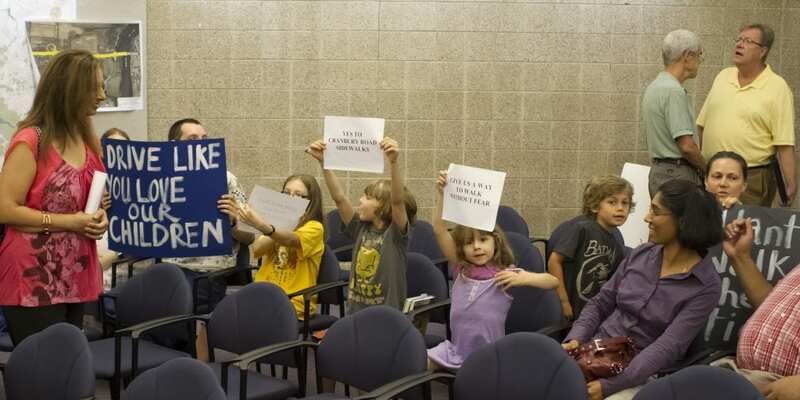 Despite WWBPA recommendations, residents’ public comments and numerous yard signs asking motorists to Drive 25, traffic calming was rejected as a project goal. We’re determined to learn to love our engineers, so in our next installment we’ll focus on the most divergent values – speed and volume. New Jersey traffic engineers don’t see suburbs, destroy downtowns with arterials and have refused to adopt road designs for neighborhoods. How will we learn to love them? We have to understand that traffic engineers love solving problems, just not social problems. They’ll design how to move cars through an intersection, but not how to preserve or create a downtown, increase property values or reduce pollution – yet the intersection design can affect all these other goals, positively or negatively. Although we’ve been building roads for millennia, we’re just realizing how motor vehicle traffic affects society. Using a computer analogy, traffic engineering is moving from the green screen to the graphical user interface – people want a richer experience, including multiple ways to get where we’re going. Traffic engineers must learn to see themselves as social scientists, concerned with how people in addition to motorists interact with the roadways – residents, runners, dog-walkers, cyclists, etc. People are puzzling – we love our cars, but hate traffic – how can engineers solve the dilemma? Find out in the next installment of Learning to Love Your Traffic Engineer – What the Public Wants. In our previous posts, we’ve seen that traffic engineers see urban where we see suburban or rural, and destroy downtowns by putting fast and wide arterials through them. As a result, conversations between residents and engineers are fraught with possible misunderstandings, making it very difficult to find the love. Fortunately, this problem is well known, so the traffic engineering profession (Federal Highway Administration) developed Context Sensitive Solutions, to “develop a transportation facility that fits its physical setting and preserves scenic, aesthetic, historic and environmental resources, while maintaining safety and mobility.” In other words, it encourages engineers to see farms and neighborhoods where we already see them, and to build appropriate roads for those places. NJDOT and PennDOT even published the Smart Transportation Guidebook in 2008, which provides flexible roadway designs, e.g. for a community collector through a suburban neighborhood, 100% compatible with existing design standards (the flexibility was already there, who knew). Problem solved? Not quite – NJDOT didn’t adopt the principles and practices in the Smart Transportation Guidebook. Why not, and how can we learn to love our traffic engineers if we can’t even agree on neighborhoods? Stay tuned for the next installment – Social Scientist. Learning to Love Your Traffic Engineer – Suburbs? 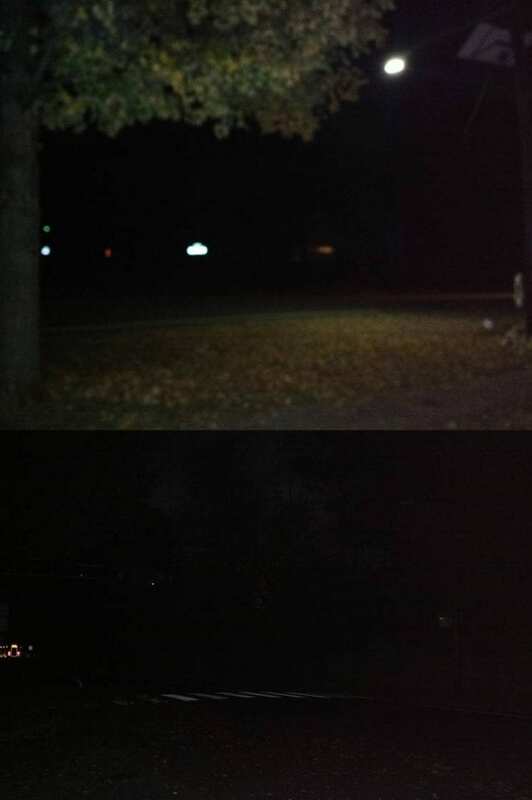 Don’t we live in the suburbs? Wouldn’t it be nice if there were Complete Streets designs that could make suburban living even better – for motorists, cyclists, walkers, runners, children and seniors? Consider the suburbs from the point of view of the traffic engineer. After all, the invention of the automobile made the suburbs available to so many people over the last half century, so traffic engineers are largely responsible for how we suburbanites live so much of our lives. As it turns out, traffic engineers don’t see suburbs, sort of like Stephen Colbert doesn’t see race. The traffic engineering world is governed by urban or rural designs only, and what we think of as suburban is by definition urban. What about our farms, like all along Windsor Road – rural, right? Sorry, the region’s population, not just the adjacent properties’, determine that all our roads are urban, since we’re in an urban area as defined by the Census Bureau (generally, over 5000 people). So the first step in learning to love your traffic engineer is to see West Windsor from their big picture point of view – urban. Stay tuned for our next installment of Learning to Love Your Traffic Engineer – Collect Local Arterials. 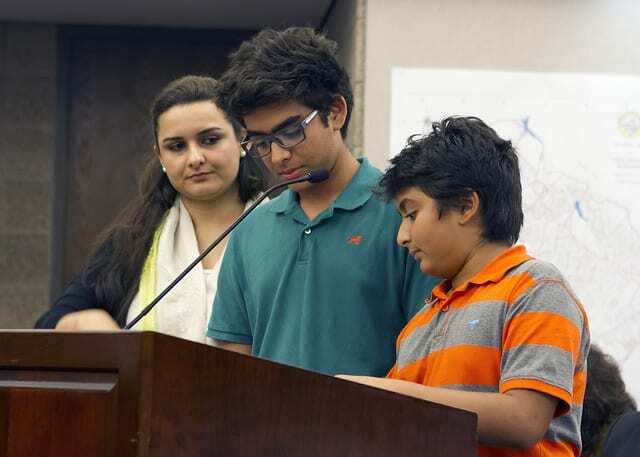 Residents of Cranbury Rd and others concerned about safe streets for children, pedestrians, bicyclists and drivers came to the West Windsor Township council meeting on July 22nd to show support for sidewalks on Cranbury Rd. Organizing the group has been Sarah Thomson and Samirah Akhlaq-Rezvi, two residents of Cranbury Rd. At the meeting, a number of residents shared stories of unsafe conditions on the road and their call for sidewalks to build a safer, healthier and more community oriented street. Members of the West Windsor Bicycle and Pedestrian Alliance were on hand to support the residents. 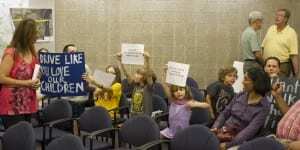 The concerns of the residents were heard by the Council. All five council members voiced support for sidewalks on Cranbury Rd and for funding an engineering study to see what options are available. 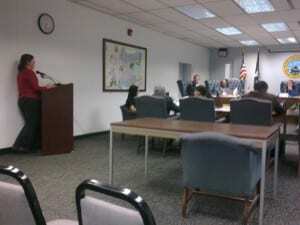 The Township is also interested in applying for a competitive state grant to fund the sidewalks. Some council members agreed that due to the urgency of the issue, there is sufficient funding in the capital budget to build sidewalks even before a grant from the state is approved. Mark Shallcross was present to photograph all the folks speaking as well as the great signs they brought! The meeting and organizing have been covered by the West Windsor Plainsboro News in this past weekend’s paper. 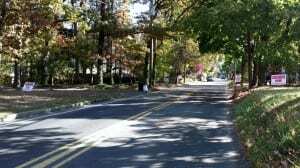 Do you support sidewalks on Cranbury Rd? There are a number of ways you can help to make sidewalks happen. Attend: There will be a public meeting with Mayor Hsueh to discuss Township and community plans for sidewalks at 10 AM on Saturday, Aug 10th at the Municipal Building at the corner of Clarksville and North Post Roads. All are encouraged to come to the meeting to show their support and maintain the momentum for action. Write: Sarah and Samirah are seeking volunteers to write letters describing concerns about safety on Cranbury Rd and support for sidewalks to accompany the Township’s grant application to the state. These can be emailed to the WWBPA and we will pass them along to Sarah and Samirah for inclusion in the Township’s application. We can also pass along your info to Sarah and Samirah if you’d like to get more involved with the community group organizing for sidewalks on Cranbury Rd. Here’s what’s been shooting around the ped/bike blogs this week. Inequality in pedestrian death victims from Streetsblog Capitol Hill: The elderly, people of color and men are more likely to be killed by cars while walking than other segments of our population, reported by the CDC. Everyone can receive health benefits from biking to work from fitnessforweightloss.com: Infographic that reports health benefits from bike commuting, like 50% reduction in heart disease risk from 3 hours of biking per week. Also suggests ways to get started. Bicycle and pedestrian infrastructure increased economic growth from America Bikes: New York City has been implementing new pedestrian and bicycling infrastructure and found, among other benefits, that local businesses grew around the new facilities. Where the protected bike lane was present, business sales increased by 49% compared to 3% in the borough as a whole. Businesses around a Brooklyn pedestrian plaza saw 172% growth relative to 18% in the borough as a whole. Comment on regional transportation policy priorities from WalkBikeJersey: The Delaware Valley Regional Planning Commission has released its annual transportation priorities, including a clickable map to make it easier to see what’s planned for our area. You can send them comments via the map or via email. It’s also interesting to see how much they plan to spend on projects. there’s a lot of zeros in those numbers, so let’s make sure that some of those millions go to bicycle and pedestrian improvements, as required by our state, county and municipal Complete Streets policies. Any interesting stories we missed? 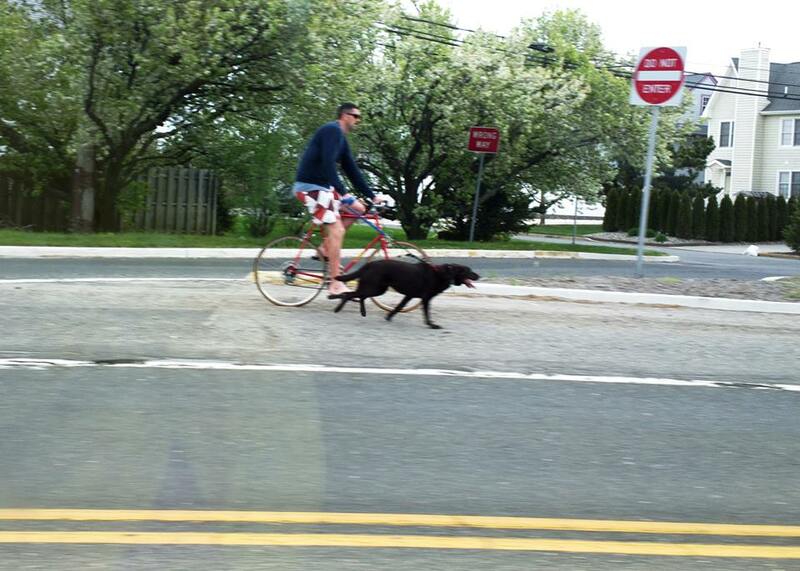 Many people regularly bicycle between West Windsor and Princeton, and the WWBPA is frequently asked at the Farmers Market for the safest route to Princeton, which involves crossing Route 1. 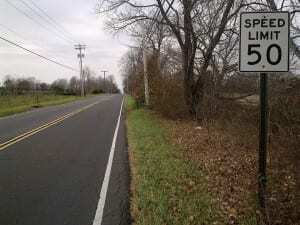 We generally recommend Washington Road (CR571) because the traffic circle slows down traffic and lets cyclists make themselves visible to motorists – unlike, for example, the high-speed ramps off Route 1 at Alexander, Meadow or Quaker Bridge roads. 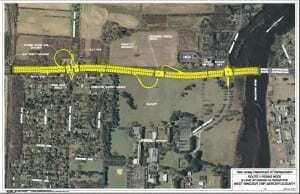 West Windsor Township Council supports this, and adopted a resolution calling on Mercer County to designate a bicycle route along CR571 (West Windsor Twp Council Resolution 2010-R174). 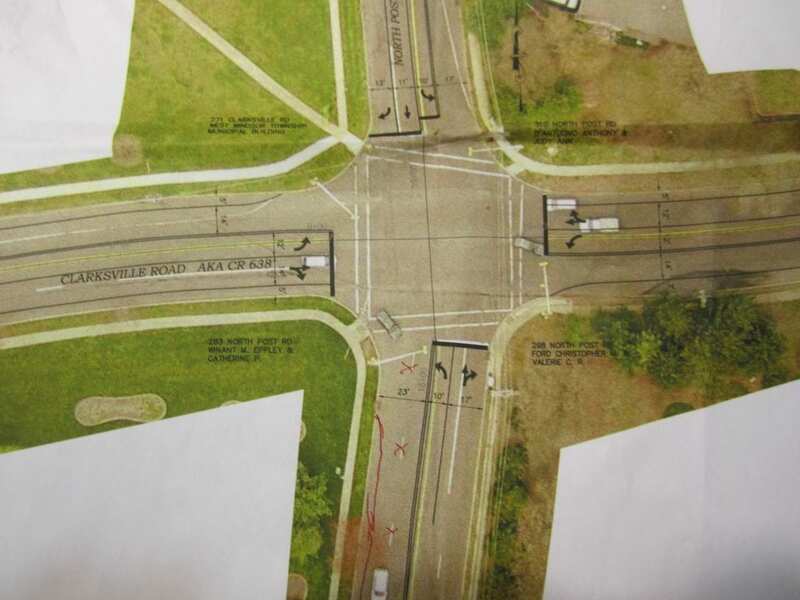 Since West Windsor, Mercer County and NJDOT have all adopted Complete Streets policies, we were disappointed that no bicycle or pedestrian safety accommodations were evident in the jughandle concept design. 1. 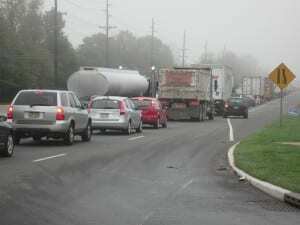 Add a multi-use path at least on the east side of Route 1 from Alexander Road to Plainsboro, to connect the Dinky Line multi-use path behind the Alexander Road offices to the Penns Neck neighborhood and on to the hospital (and wellness center) in Plainsboro. 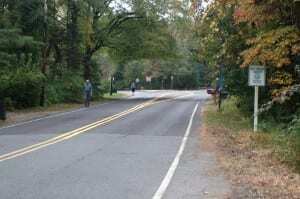 Improved pedestrian and bicyclist accommodation for Penns Neck will prevent this stretch of Route 1 from becoming as deadly as further north in Middlesex County. 2. Create a safe bicycle route crossing Route 1 using Washington Rd/CR571, for example by reducing the design speed of the jughandle linking southbound Route 1 traffic to CR 571/Washington Road, or by creating a stop from the jughandle before turning right on CR571, to allow drivers an opportunity to look for bicyclists. 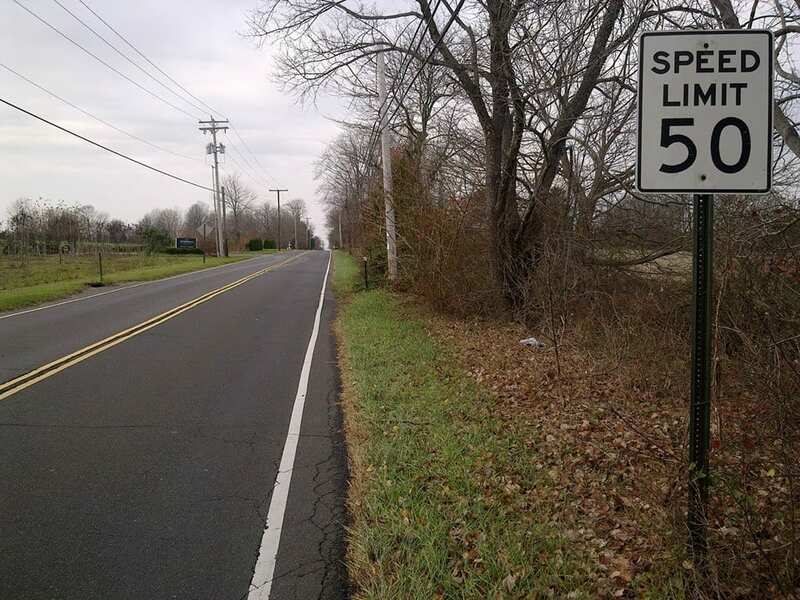 The current highspeed jughandle merge design will create a dangerous condition for bicyclists traveling the bicycle route between Princeton and Princeton Junction train station. 3. Add marked crosswalks to all legs of the intersections. 4. Add bicycle lanes or sharrows to the improved intersections to guide bicyclists and alert motorists to the safest lane positioning while using the intersections. 5. Add a westbound bicycle crossing at Harrison even though there is no motorized vehicle crossing in that direction. 6. Add an off-road multi-use trail crossing Route 1 to connecting trails adjacent to the Dinky tracks, as described in the West Windsor Twp Circulation Element of the Master Plan. Please contact our officials to support these recommendations. We recently sent a letter to the editor to the various local papers thanking NJDOT Commissioner James Simpson for reopening the Route 1 jughandles in West Windsor, and encouraging our officials to implement Complete Streets to reduce local congestion and build livable, bicycle and pedestrian friendly communities, rather than encouraging further sprawl. The West Windsor Bicycle and Pedestrian Alliance thanks New Jersey Department of Transportation (NJDOT) Commissioner James Simpson for re-opening the Route 1 jughandles last week. We applaud NJDOT’s leadership in recognizing the need to maintain a balance between local and long-distance congestion. Transportation policy favoring long-distance traffic creates sprawl, which is not desirable for economic, environmental, public health and safety reasons. In contrast, Complete Streets policies encourage sustainable development by creating livable communities. NJDOT’s Complete Streets policy leads the nation, according to Smart Growth America, requiring roads to be designed and built for all users, including bicyclists and pedestrians. 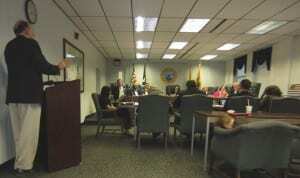 Mercer County and West Windsor Township have also adopted Complete Streets for roads under their jurisdictions. Implementation will create viable alternatives to driving that mitigate local congestion. Implementing Complete Streets in West Windsor, including crosswalks, connecting sidewalks and bike lanes around the train station, has already reduced congestion. We recently counted 355 people biking and walking near the station during evening peak hours, up 18% over last year. We encourage everyone to reduce congestion and stay healthy by biking and walking for short trips – we even think it’s fun. Although congestion is here to stay, Commissioner Simpson improved livability by reopening the jughandles – let’s do our part by biking or walking to school and work whenever possible. Ken Carlson Loses A Race! But that was a good thing. WWBPA Advisor and Past President Ken Carlson organized a bike advocacy event in his new hometown of Somerville, Massachusetts. The challenge was for a cyclist, a T-rider (subway), and an auto to race from Davis Square in Somerville to Kendall Square in Cambridge. Ken drove the car. New York City did the same contest this week (after all, it is National Bike to Work Week) and once again the bike won. The cyclist traveled from Williamsburg to SoHo in morning rush hour in 15 minutes. The subway took 26 minutes and driving, 41 minutes. 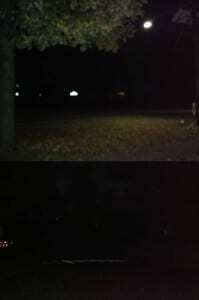 As for West Windsor? Think how long it takes you to drive all the way around the station to the Vaughn Drive lot (unless you’ve been commuting so long that you have a Wallace Road permit) and to walk to the platform in the morning, and then to get out of the Vaughn Drive lot and over the roundabout on the way home. Your bike would be right by the tracks and probably would get you home in a similar amount of time, no sweating involved. And let’s not even think about the time you spend (or intend to spend) at the gym doing cardio. Then the bike will surely win! 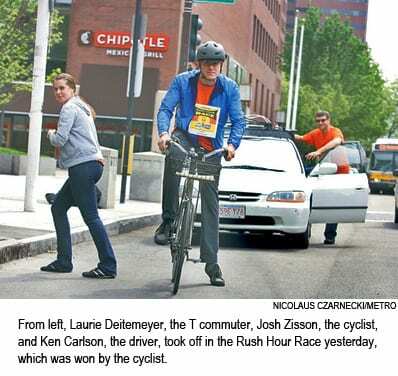 Read more about Ken’s race at Metro.US and Boston.com, and tell us about your bike commute. Comments Off on Ken Carlson Loses A Race! 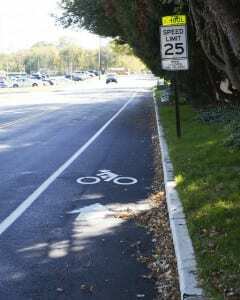 Mercer County’s Board of Chosen Freeholders, the legislative branch of Mercer County, adopted a resolution supporting a Complete Streets policy on Thursday, April 26, 2012. Mercer now joins Monmouth County as the only two counties in the state to adopt Complete Streets, which requires roadway projects to support all users, including bicyclists and pedestrians, by default rather than by exception. We thank the Freeholders for their support, and look forward to our county roads becoming more bicycle and pedestrian friendly! Realistically, infrastructure projects are very long term in their planning and implementation, so with consistent and persistent application, we should see results after several years, while a complete transformation may take decades. We look forward to working with the county planners and engineers to make our county the best place in the state to live and work. Essex County also ad0ppted a Complete Streets policy, but we’re glad to say that Mercer was only 2 days behind! Mercer County Freeholders discussed adopting a Complete Streets policy April 10, supported by over 15 residents from across the county. Freeholder Andrew Koontz of Princeton drafted a resolution for consideration, and a lively discussion ensued. Please join us at the April 24 Freeholders meeting to support Complete Streets! WWBPA trustees Jerry Foster, Alison Miller and Daryl McMillan spoke during public comments, as did Jeff Laurenti (pictured) of the Trenton Cycling Revolution, Patricia Van Hise of Hamilton and President of the Princeton Free Wheelers bike club, John Stevenson of Hopewell Township and Diane Ciccone, former West Windsor Township Council and current WWBPA member. We were supported by other WWBPA trustees, members and residents from Trenton, Lawrence, Princeton and West Windsor. Thanks to everyone who showed up! Please join us Tuesday April 24 at 6:30pm at the McDade County Building in Trenton to witness Mercer County becoming the 2nd county in New Jersey to adopt Complete Streets. Essex County is also considering a Complete Streets policy, so with luck we can be first. Please contact our officials to show your support if you can’t make it to the meeting!